Full thickness base. P-Tex 2000 Electra. 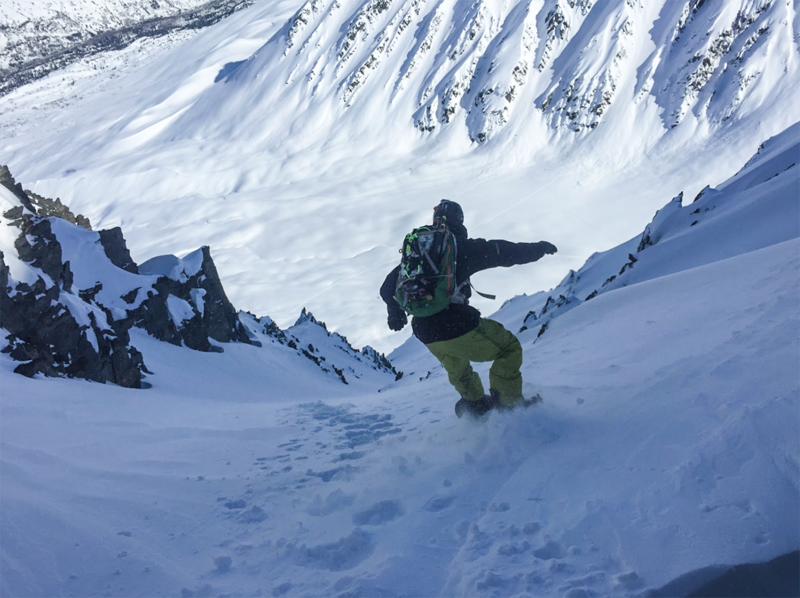 G3, a well established backcountry ski producer, first entered the splitboarding realm in 2013 / 2014, blending their ski technology, materials and construction into lightweight splitboards. Since their entry into the splitboarding market, G3 has offered 2 splitboards: The powder-specific, directional Scapegoat, and all-mountain, directional Blacksheep. The Scapegoat is their pinnacle powder board with a light weight, tapered powder shape and impressive construction similar to their skis. The Scapegoat utilizes G3’s Carbonlight Construction – a lightweight build with glass and carbon, with the goal of remaining stable, responsive and relatively cheap for a carbon splitboard. Although the Scapegoat is not the lightest board on the market, it is only 0.55 kg /1.21 lbs (claimed weight) heavier than the Amplid Milligram (the lightest splitboard I’ve used). The Scapegoat looks pretty unique given the sculpted look on the topsheet, similar to that of G3’s skis. The Stealth Razor Edge profile, a slight bevel/taper beginning about ¾” from the edge of the board, is designed to reduce mass and shave weight off the board. The Scapegoat also features similar sculpting and tapering in the center of the board along the nose and tail for the same reasons. The Scapegoat features G3’s Powder Rocker camber: camber between the bindings with an early rise rockered nose for optimal floatation in deep powder. This profile is extremely effective in keeping the nose high, while sinking the tail for easy powder riding. While similar to the profile utilized by Amplid and Jones, G3’s Powder Rocker feels more exaggerated which should help on the truly deep powder days, reducing leg fatigue and providing more agility when in tight terrain and trees. While G3 does not rate the flex of the Scapegoat, it feels like 7-8 out of 10 to me. To put that in perspective, the Jones Carbon solution is much stiffer, and rated a 10 out of to 10 on their flex scale, while the Amplid Milligram feels around 6-7 out of 10. Thus, the flex of the Scapegoat is very well suited for the shape, camber and intended use of the board. It is stiff enough in split mode to avoid the dreaded “dished skinned track”, in which the board flexes so much, it prevents adequate glide while breaking trail, forming U- shaped depressions — typical of a DIY splitboard. The stiffer flex translates into efficient skinning, stable riding platform at high speeds in deep powder, yet feels very playful riding while hitting natural features and drops, as well as riding tight trees. The powder specific shape of the Scapegoat has been very impressive in bottomless powder. The board features a 40 mm taper in the tail and an 8 meter sidecut radius, which helps effectively sink the tail and float the nose, a similar concept to a swallowtail shape, although the Scapegoat feels much more agile and can be ridden in shorter lengths than most swallows I’ve been on. After approximately 30+ intense days of use in Thompson Pass Valdez, the top sheet and base show little to no wear and still look new. The extruded nylon topsheet has been very effective in protecting against scratching and any UV damage. Although I have not had any issues with this board, it is worth noting that one of my main backcountry partners suffered a catastrophic failure. While skinning with a 14/15 166 cm Scapegoat in 1- 2 feet of powder, the ski broke roughly 8-10” in front of the touring bracket. It was not a clean snap, more of a folded crease through the laminates and a snapped core. Hopefully that weakness has been addressed and resolved in the newer generation of G3 splitboards, and I haven’t had any issues with my Scapegoat, but I’ll update if I do. i thought i would just add to it as i have ridden a 16/17 Scapegoat here in japan and have had a similar thing happen to my board that your friend experienced. I was riding a big open face bank with some heavy long front edge type turns. Got to the bottom and found the board had buckled 3-4 cm up from the binding. not ideal. I am in the process now trying to talk to G3 about it. Have you had anyone else with a similar issue? This is something G3 needs to get resolved by the 17/18 models. I know of three other G3 boards (2 Scapegoats, 1 Black sheep) that have failed in this same fashion, and as of a week ago, I noticed that my board is creased, broken and delaminating right in front of my front binding mount (when in ride mode). From talking with friends, it seems that G3 has been unresponsive to warranty claims. I personally have not dealt with the customer service yet (since it happened so recently), but I will be sure to include in my review how they handle repairs, and that the 15/16 & 16/17 boards are prone to failure. Sorry to hear about your board! If you’re looking for a strictly powder board replacement, the K2 Splitbean may be worth a look. I should have a review of that up in the upcoming weeks. The review is in my opinion spot on. I had this board for one season, and its really great for powder. My favorite splitboard ever. But concerning durabuility… my board also delaminated. Im also in the prosess talking to G3. So there seems to be a issue that G3 has to take responsibility for. Shame that this fun board has durabuility issues.